A good massage improves health! Not only does a good massage help to loosen tight muscles, it also helps to drain lymph nodes to improve immune system, to relieve stress and stimulates organs. What can be better to massage with the pure shea and active African essential oils? 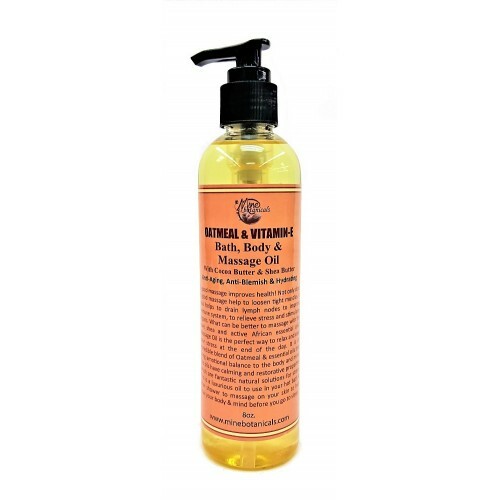 Massage Oil is the perfect way to relax and ease your stress at the end of the day. It is an incredible blend of Oatmeal & essential oils that bring emotional balance to the body and mind. The oils have calming and restorative properties which are fantastic natural solutions for stress. This is a luxurious oil to use in your hot bath & after shower to massage on your skin to help relax your body & mind before you go to sleep. Ingredients:- Raw Butyrospermum Parki (Shea Butter), Oatmeal, Vitamin-E Oil, Cocoa Butter, Lavender Oil, Olive Oil, Grapefruit Seed Extract, Almond Oil, Sunflower Oil, Black Seed Oil, Bergamot Oil, Ylang Ylang Oil, Vegetable Glycerin, Glycine Soja (Soybean Protein), Spearmint, Peppermint Oil & Natural Fragrances. Use: - Shake well before use. Take adequate amount in your palm and massage as you required. It can be used for lymph drainage also.